UPDATE: on july 28, 2015, it was announced that herzog & de meuron’s design for the 57-storey tower had been approved by local authorities. the scheme was originally scheduled for completion by 2017, and will include 3,200 living units, 240,000 square meters of commercial offices and more than 100 retail outlets. 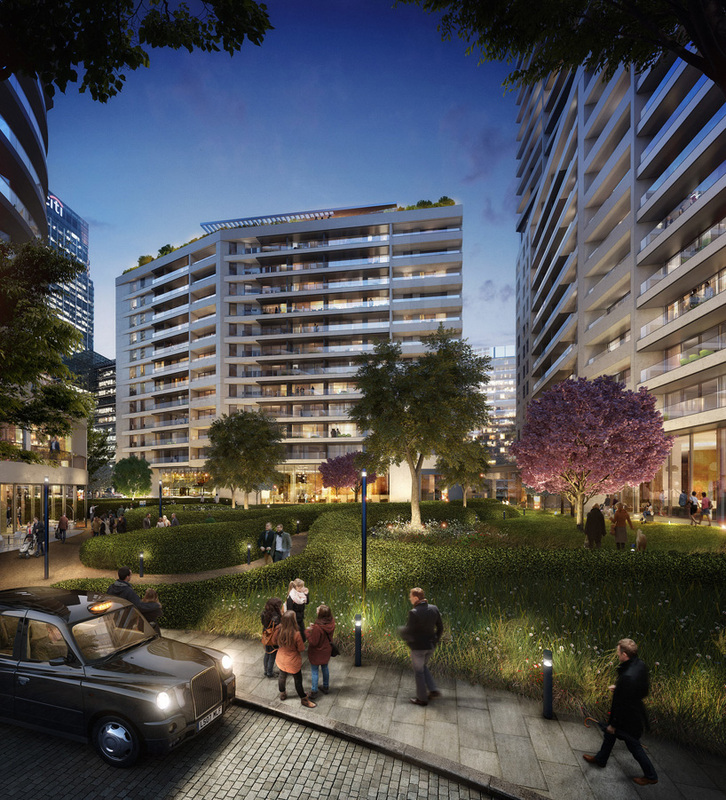 after lengthy public consultation, planning application has been submitted for phase one of london’s canary wharf development, forming a distinctive neighborhood for the city. 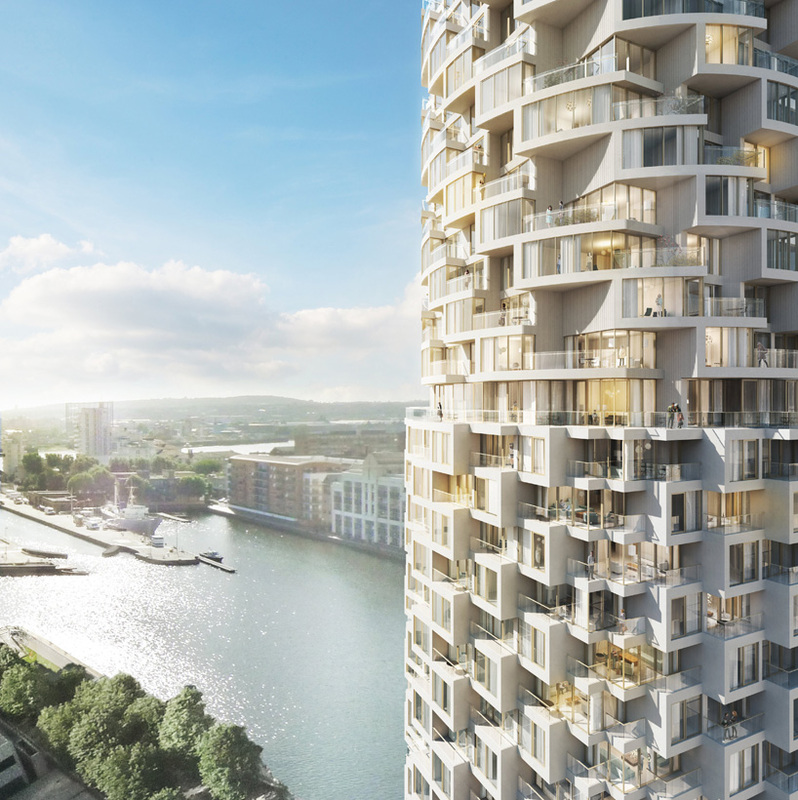 part of allies and morrison‘s revised masterplan for the area, designs for a new multi-storey tower by herzog & de meuron have been unveiled, alongside further residential properties which will be realized by london-based office stanton williams. 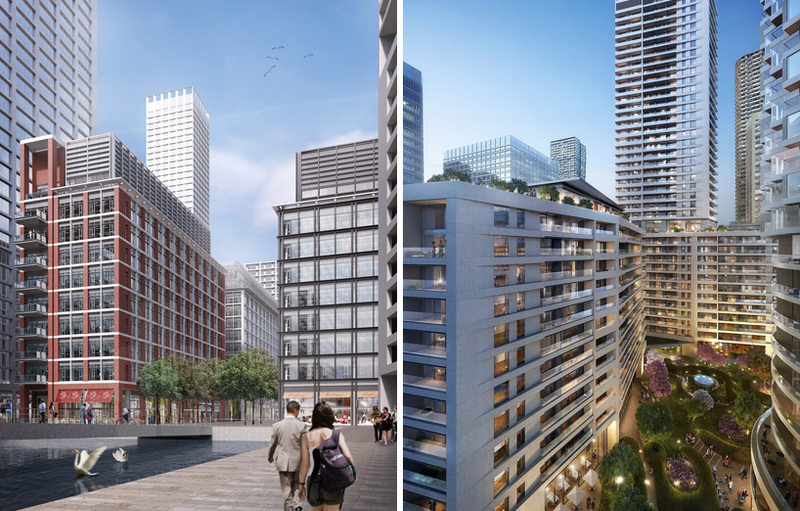 the mixed-use development, entitled ‘wood wharf’, will eventually offer over 3,000 living units, 240,000 square meters of commercial offices and more than 100 retail outlets, forming a diverse working and living environment. the various programs will be interspersed with a variety of public spaces, including parks and plazas. the southern edge of the site will include 1km of dockside boardwalks, allowing the scheme to form a close relationship with the waterfront. further stages of development will see the development include a primary school, a multi-purpose sports center and a healthcare facility. a bus route, and improved pedestrian access to underground stations will ensure that the scheme remains connected to the city. if planning permission is approved, construction will begin in 2014, with the first of the buildings scheduled to be completed by 2017. 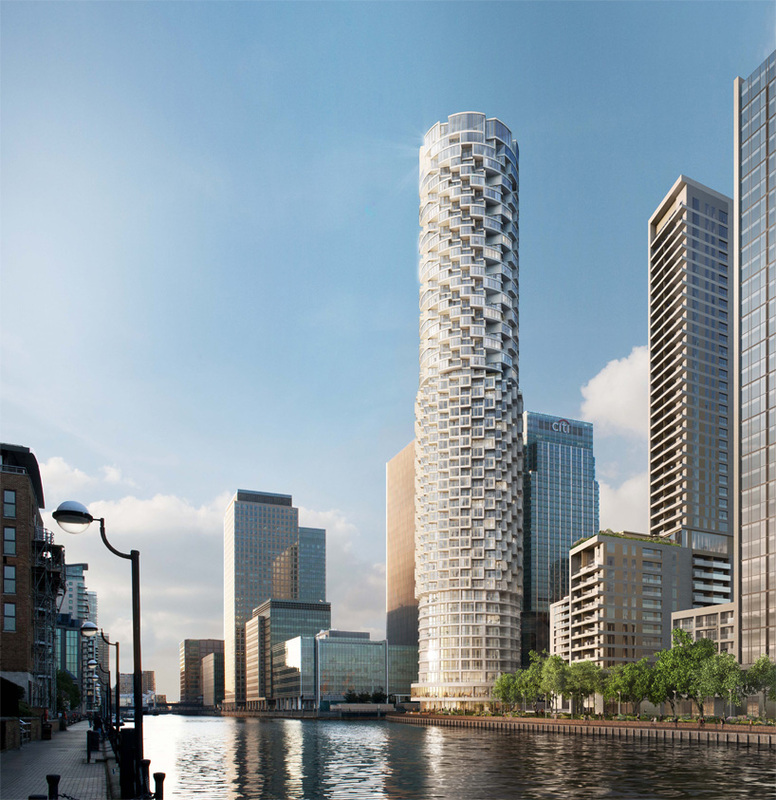 ‘this is an exciting new project for canary wharf group which represents the continued redevelopment of east london almost 30 years after the original transformation of canary wharf began. the revised masterplan will create a strong and complementary mix of uses, and provide new homes, offices and retail spaces set within a network of streets and public spaces, designed to support the social life of new residents, employees and the surrounding community. it is a reflection of the demand we are seeing in the market, and is an opportunity for us to further expand the appeal of canary wharf by creating a new and exciting mixed use neighborhood which will offer greater diversity and a richer urban fabric for the fast emerging city center of canary wharf’, commented sir george iacobescu, chairman and chief executive of canary wharf group. 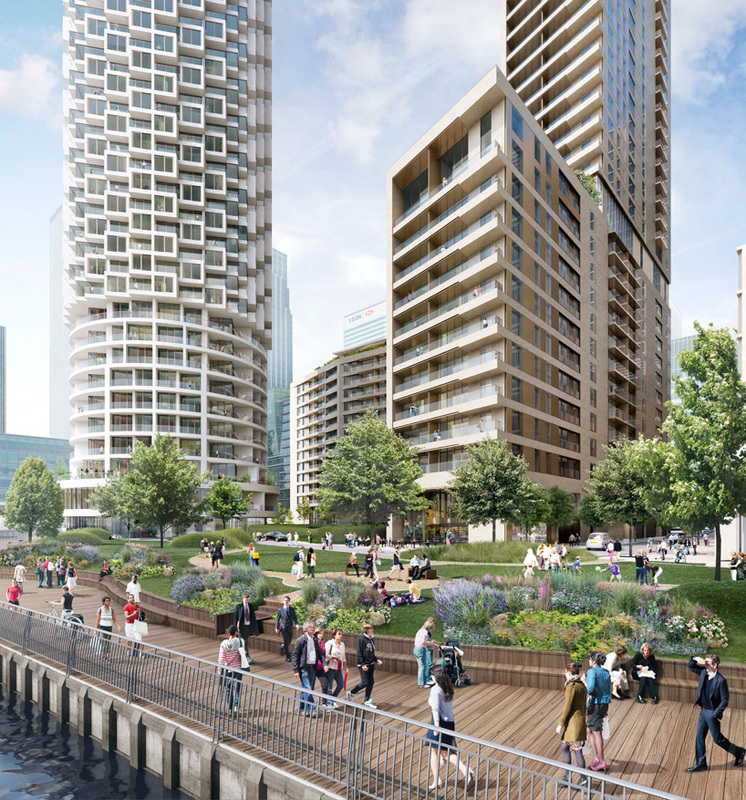 ‘with an extensive new network of public spaces and water’s edge boardwalks, the wood wharf masterplan places high quality public space at the heart of the design process. 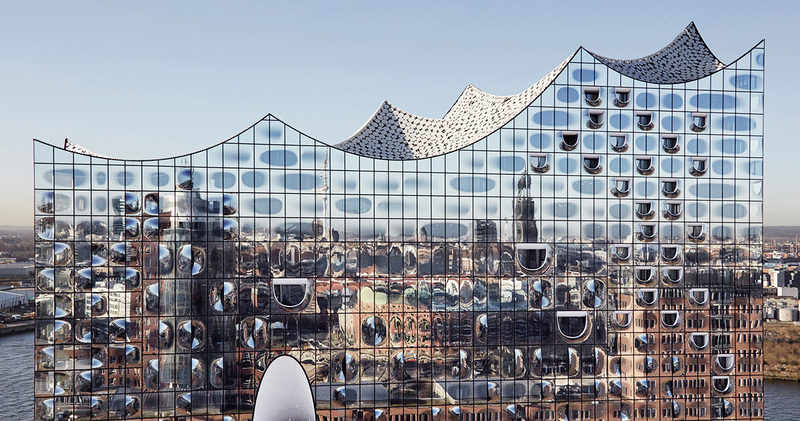 the principle achievement of the masterplan – the ‘glue’ which holds the neighborhood together – will always be its well-considered network of streetscapes, squares, parks and water spaces. 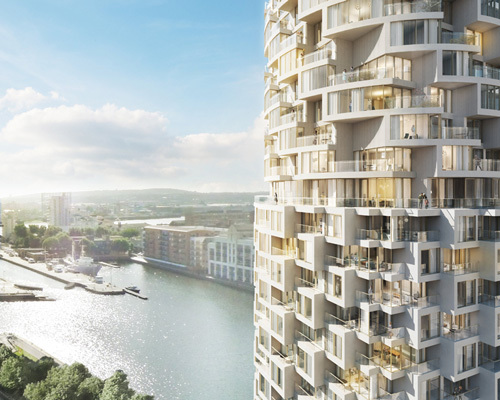 we are building a community that will both support, and be supported by, the success of canary wharf and the 110,000 people that work and visit canary wharf each day,’ explained robert maguire, project director for wood wharf. Amazing project, let’s hope it sees the light of day! … and Ballard’s High Rise finally came to pass.